On July 18, 2017, about 1330 central daylight time, a Piper PA-25-235 airplane, N7388Z, collided with terrain while maneuvering at a low altitude about 7 nautical miles northwest of Pierce, Nebraska. The pilot was seriously injured, and the airplane sustained substantial damage. The airplane was owned by a private individual and operated by the Bloomfield AG and Aerial Service company as a Title 14 Code of Federal Regulations Part 135 aerial application flight. Visual meteorological conditions existed near the accident site at the time of the flight, and a flight plan had not been filed. The flight departed the Bloomfield Municipal Airport (84Y), Bloomfield, Nebraska, about 1330 on a local flight. 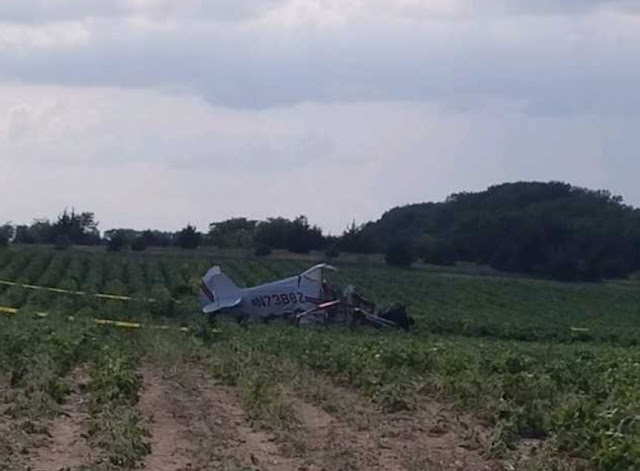 The pilot reported to a Federal Aviation Administration (FAA) inspector that he started working for the operator as an agricultural pilot in the Spring of 2017. The pilot's flight logbook indicated that he had flown 17.5 hours in the accident airplane before the accident occurred, which was also his total experience as an agricultural pilot. On the day of the accident, he started spraying operations at 0800, and completed two flights before the accident flight. The pilot stated that the airplane was loaded with 60 gallons of chemical and about 32 gallons of fuel for the 60-acre field that he planned to spray near 84Y. He stated that he set a smoke path during the initial pass and flew over the field from north to south. He stated that the airplane was also equipped with a Trimble GPS system and marking flags to track the airplane's progress across the field. He reported that he had no further memory of the flight. A witness stated that he observed the airplane when it sprayed two fields in the morning and that the airplane's engine was running normally during those two flights. He stated that he also observed the airplane during the accident flight. He saw the airplane fly-by for an initial check of the field. It then started spraying along the east side of the cornfield. The airplane made its turn at the north end of the field and then started its second pass heading south. About mid-way down the field, adjacent to the irrigation pivot point, the witness observed blue smoke coming from the airplane for about 150 to 200 ft. He estimated that the airplane speed was about 100 mph. The airplane clipped a tree at the south end of the field and it rolled completely over. He lost sight of the airplane behind the tree line. He located the accident site and assisted the pilot until emergency responders arrived. Two neighbors, who saw the airplane spraying the field, stated that they had heard a "popping" noise but did not see the airplane crash. The witness stated that he did not hear anything out of the ordinary or the popping noise, although his all-terrain vehicle was operating and the radio was on. FAA inspectors examined the airplane wreckage at the accident site. They reported that the airplane's right position light along with 1/4 of the right wingtip were found lying next to the tree that was struck. The branches that were struck were about 30 to 40 ft above the ground. The main wreckage was found about 360 ft from the impacted tree. The chemical hopper lid, which is located on the top of the aircraft behind the engine compartment, was found imbedded in the bottom of the ground scar created by the initial ground impact. The propeller spinner was found "shoved" into the propeller blades and spinner bulkhead, which is consistent with a nose first contact. The airplane was found lying right side up, facing to the north. The engine compartment and cockpit exhibited aft crushing. The airplane's tail was buckled downward just aft of the cockpit's rear bulkhead. Both wings exhibited aft crushing, but the right wing had extensive damage outboard of the wing strut. The flight controls exhibited continuity from the cockpit to the control surfaces. The propeller blades exhibited "S" bending and chordwise scratching. The airplane was equipped with a 250-horsepower Lycoming O-540-A1A5 engine, serial number L-1365-40. It had a total time of 1010.6 hours and 35 hours since the last overhaul. It was installed on the accident airplane on April 2, 2017. The airplane was equipped with a smoke marker, which would produce blue smoke used as a field marker, to aid in lining up spray runs, and to provide wind drift indications near the ground. At 1356, the surface weather observation at the Norfolk Regional Airport (OFK), located 18 nm southeast of the accident site, was wind light and variable; visibility 10 miles; cloud condition 3,800 ft broken; temperature 31° C; dew point 21° C; and altimeter setting 30.00 inches of mercury. On July 18, 2017, about 1356 central daylight time, a Piper PA-25-235, N7388Z, collided with terrain while maneuvering at a low altitude about 7 nautical miles (nm) northwest of Pierce, Nebraska. The pilot was seriously injured, and the airplane sustained substantial damage. The airplane was owned by a private individual and operated by the Bloomfield AG and Aerial Service company as a 14 Code of Federal Regulations Part 135 aerial application flight. Visual meteorological conditions existed near the accident site at the time of the flight, and a flight plan had not been filed. The flight departed the Bloomfield Municipal Airport (84Y), Bloomfield, Nebraska, about 1330 on a local flight. At 1356, the surface weather observation at the Norfolk Regional Airport (OFK), located 18 nm southeast of the accident site, was wind light and variable; visibility 10 miles; cloud condition 3,800 ft broken; temperature 31 degrees C; dew point 21 degrees C; and altimeter setting 30.00 inches of mercury.